Two facts about me: I am a keen reader and I live in a really, really small flat. 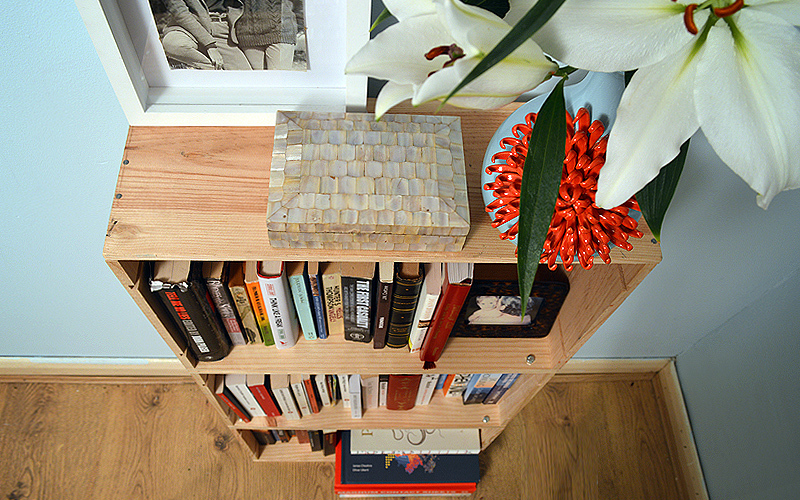 Though seemingly unconnected, the fact that those two things are absolutely true means that my very small flat is often overrun with books, crammed into the oddest corners or wedged behind furniture. It also means that my life is often a mess. That is no way to live, so a few weeks ago I said: ‘ENOUGH!’ and vowed to produce more appropriate storage for my musty tomes. I looked around for a good bookshelf to fit a rather small and awkward little area of the flat, but nothing seemed quite right. Luckily, the Pal is rather handy with the tools, and I had an idea. 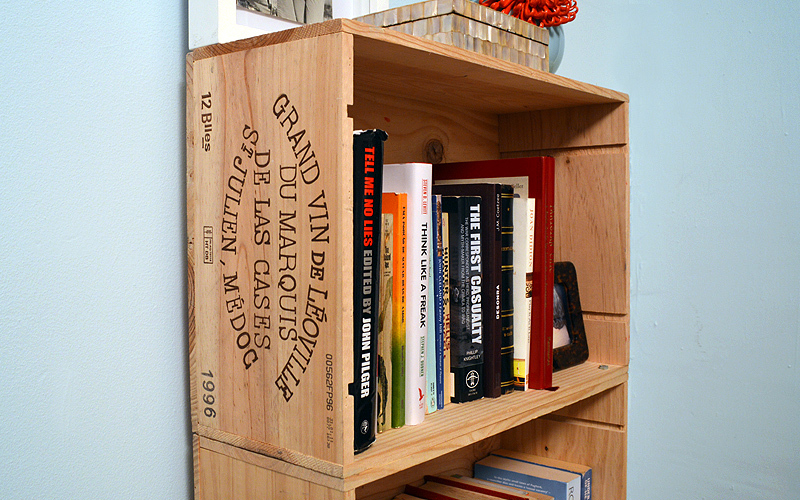 The Wine Crate Bookshelf, a no-muss no-fuss bit of DIY that even the most tool-averse can execute. -Pile the crates one of top of the other, and with a felt-tip pen mark where the bolts are going. For a three-tier shelf like mine, you will need four bolts holding the bottom and middle crates together (two in the front, and two in the back), and four more holding the middle and top crates. Make sure you mark both sides of each hole- that is where the bolt is going in and where it is coming out. -Once you are happy with where the bolts are going, drill small holes all the way through the crate where you marked them. Do each crate separately, do not try and keep them piled up while you drill. -Once all the holes have been drilled, pile the crates back up again, and using the nuts and bolts, screw them together. That is actually it. 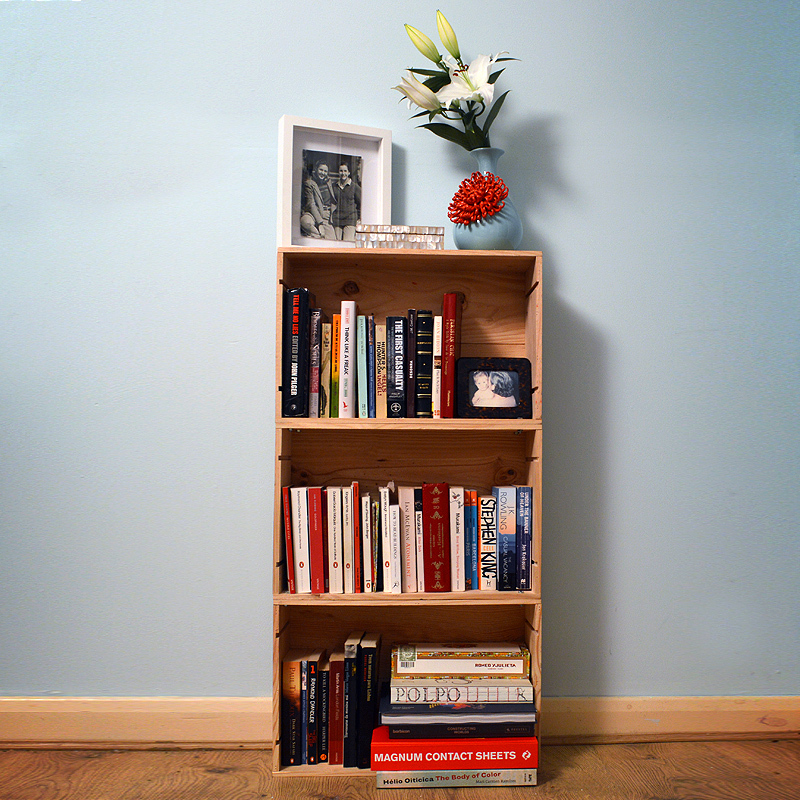 So easy, so practical- and I think it looks great. Thanks, Lilian! It looks great, especially when decorated with nice personal items and little family treasures!